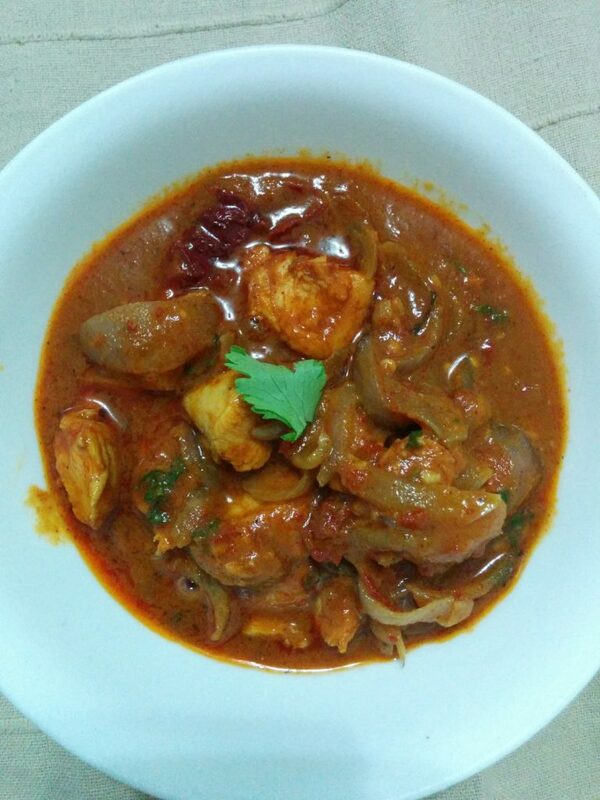 A moderate spicy recipe – chicken cooked in the garlic and chillies. Take the chillies and garlic in the mixer grinder and put a little water in the mixer and make that into a fine paste. Marinade the chicken in that paste for 30 mins. Save the remaining. Take a pan on medium flame and put oil in it. When oil is hot pour the chicken in the pan and stir. Cook for 10 minutes with lid on. After this add sliced onions and again cover it with lid and cook for 10 more minutes. Check the salt and check that there should not be raw flavour of garlic or chillies. Once the gravy is fragrant add the chopped coriander and kasoori methi for garnish. Serve hot.